Death by werewolves? Bring it on. My overall reaction to this book wasn't great. Don't get me wrong, I enjoyed the book, but it definitely could have been better. Keswick had an interesting story, but the way it was written kind of overshadowed the real plot. I found it hard to relate to the main character, Kasey. She seemed like the stereotyped teenage girl that comes to mind for most adults. The thing is, she isn't exactly realistic. Maybe there are a few teens like Kasey out there, but her personality seemed like it was only skin deep. She had her good moments here and there, but she became annoying too. The plot was good, and it kept me interested. I really did want to know what would happen next. There isn't much of a set up before the story takes off, which kind of bothered me. Within the first chapter, Kasey has been through more than others characters go through in half of the book. No setting the stage, character development, etc. Still, there was a mystery that will keep you guessing throughout the novel. I have to admit, I laughed at this book a lot. Kitty Keswick knows how to tickle her reader's funny bone. Whether it was Kasey or her friends, there was always something to make me smile. The book is told through Kasey's blog, and the comments were hilarious. The whole blog idea also gave the book a more original feel. * To see the Freaksville trailer, click here. 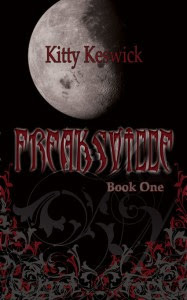 * To see my interview with Kitty Keswick, click here.